Home » Robalo 2018’s – Special Savings! Robalo 2018’s – Special Savings! We’ve got just a few remaining 2018 Robalo models and now is your opportunity to take advantage of special discounts through Pier 33. These new boats are showroom-kept and carry full warranty from Robalo and Yamaha, but we do need to make room for arriving 2019’s. Special pricing is not published on-line, you must contact a Pier 33 Robalo Specialist: (269) 983-3333. All sales are F.O.B. St. Joseph, MI – Pier 33 does not export or drop ship. Get aboard with Pier 33 for your on-water orientation. 2018 Robalo R160 Center Console; Yamaha 70 HP. Deepwater Black. Trailer. Was $28,660. 2018 Robalo R180 Center Console; Yamaha 115 HP. Deepwater Black. Trailer. Was $37,979. SOLD! 2018 Robalo R200 Center Console. Yamaha 150 HP. Ocean Blue, Bimini Top. Trailer. Was $48,250. 2018 Robalo R202 Explorer. Yamaha 150 HP. Deepwater Blue. T-Top. Trailer. Was $50,728. SOLD! 2018 Robalo R202 Explorer. Yamaha 150 HP. White. Bimini Top. Trailer. Was $47,723. 2018 Robalo R207 Dual Console. Yamaha 150 HP. Trailer. Was $49,435. 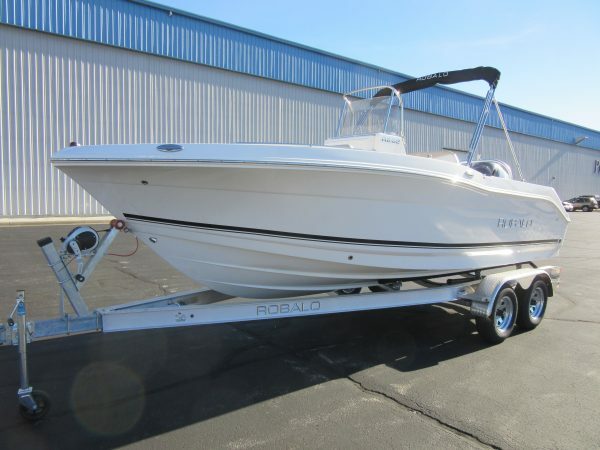 2018 Robalo R242 Center Console. Yamaha 300 HP. Hard Top. Was $95,706. 2018 Robalo R247 Dual Console. Yamaha 300 HP. Hard Top. Trailer. Was $114,324. SOLD. Combine these savings with the Yamaha “Say Yes To Reliability” Sales Event and receive extended warranty on all models! Our 2018 Robalo R160 and 2018 Robalo R180 are also eligible for special rebates from Yamaha! And, for a limited time, earn a Bonus Cash reward from Robalo on any of these 2018’s!